35% SILVER WARTIME JEFFERSON NICKELS Due to the military demand for nickel during World War II, the composition of nickel 5c coins in America was changed to an alloy that included 35% silver, beginning in October 1942 and continuing through 1945. 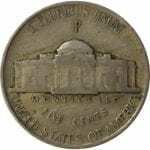 All "war nickels" as they are commonly called, have a large mint mark above the dome of Monticello on the reverse of the coin -- "P" for Philaelphia, "D" for Denver and "S" for San Francisco. These wartime silver nickels are the only US nickels that have the mint mark above the dome. A 1942 nickel without a mint mark above the dome was produced prior to the alloy change, and contains no silver. Buying 35% silver wartime Jefferson nickels is an affordable way to start investing in precious metals. Due to the military demand for nickel during World War II, the composition of nickel 5c coins in America was changed to an alloy that included 35% silver, beginning in October 1942 and continuing through 1945. All “war nickels” as they are commonly called, have a large mint mark above the dome of Monticello on the reverse of the coin — “P” for Philaelphia, “D” for Denver and “S” for San Francisco. These wartime silver nickels are the only US nickels that have the mint mark above the dome. A 1942 nickel without a mint mark above the dome was produced prior to the alloy change, and contains no silver. Buying 35% silver wartime Jefferson nickels is an affordable way to start investing in precious metals.